police believe that the child was first kidnapped, sexually assaulted and was killed. She has also received a head injury. Tension prevails after a body of a 7-year-old girl of Simalguri area of Assam was found at the Rajgarh roadside of Chessa under Banderdewa Circle of Papum Pare district in Arunachal Pradesh on Sunday morning. The child had reportedly been missing since Saturday when she left for school and the Assam police received a missing complaint at around 10 PM by the parents at the Simalguri Police Outpost. The information was passed on to the Arunachal Pradesh Police at around 11 PM and a team of Assam Police also visited the Chessa OP. 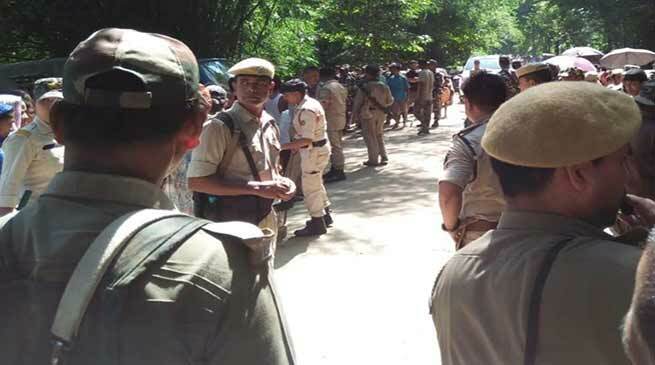 Capital Complex Superintendent of Police M Harsha Vardhan informed that the police from Chessa police outpost of Arunachal Pradesh arrived first at the scene after information received from local residents. Prima facie also leads police to believe that the child was first kidnapped, sexually assaulted and was killed. She has also received a head injury . However, post mortem report is awaited to ascertain the cause of death and whether she was sexually assaulted or not. The inquest was conducted by Banderdewa executive magistrate Neelam Teji from Arunachal. The body was handed over to the Assam police and subsequently taken to the civil hospital in Lakhimpur for post mortem. Vardhan said that the capital police coordinated with North Lakhimpur district police for conducting legal formalities. On whether any arrests were made, the SP said, “It is a wide dragnet as of now”, but assured of all possible assistance to the Assam Police, where the case has been registered, to solve the case at the earliest. It is also reported that an agitated mob of locals from Assam pelted stones at the police outpost in Chessa, but was soon brought under control. The window panaled and other properties were damaged. “The mob was quickly brought under control. No major damage has been caused and a case has been registered regarding the same at Banderdewa Police Station vide case no-26/18 u/s-147,148,149 IPC, RW Sec 3 of PDPP Act ”, the SP informed. A case of kidnapping and murder has been registered at the Simaluguri police outpost and further investigation would be carried out by them bus assured to extend all support . The Arunachal Pradesh Police was represented by SP M Harsha Vardhan, Naharlagun SDPO Make Bui and Banderdewa OC K Yangfo, while the Assam Police was represented by the North Lakhimpur SP and ASP, Bihpuria police station OC and Simaluguri outpost in-charge. It is to mention that the situation in the area is under control and sufficient force have been deployed and intensive patrolling have been ordered to neutralised if any law and order problems is erupt. Let the investigation process be carried out by both the states’ concern Department; and nab the sick mental culprit(s). At this hour it will be hopeless to point fingers at one another, rather both the states should fight unitedly against such ill mental person(s).